1. Carnival Cruise Line caused quite the stir this week after announcing it’s eliminating free room service. The news unsurprisingly upset many people who feel it’s an attempt to further nickel-and-dime consumers. However, the room service menu will remain á la carte with items ranging from $2 to $6, while some of Carnival’s competitors charge flat fees to use their room service option. 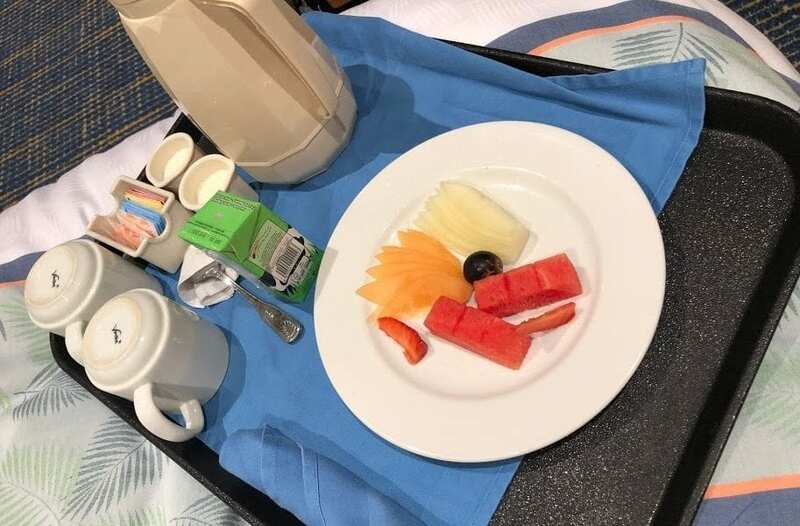 Plus, the continental breakfast is the single exception to this new policy; it is the one thing that will remain complimentary to Carnival cruisers. 2. Royal Caribbean dropped its warning to cruise guests about Nassau. Previously, the line had been issuing general warnings onboard to guests about the risks of crime while traveling around Nassau, including the mention of specific areas such as the Arawak Cay Fish Fry. After talks with the Minister of Tourism and Aviation for the Bahamas (who argued that, statistically, Nassau is just as safe as Miami or Fort Lauderdale), Royal Caribbean agreed to stop issuing the warning to its guests, instead including a brief mention of general port safety in the daily planner. 3. Cruise Lines International Association (CLIA) is reportedly “disappointed” in new taxes aimed at cruisers and tourists. Italy is proposing a tax that would allow Venice’s city council to tax day visitors, thereby using the funds to maintain the city’s infrastructure in the face of the influx of tourists. The tax is an attempt to balance the impacts of “overtourism” to the city while still maintaining the invaluable economic benefit of the tourism. 4. Norwegian Cruise Line helped one special cruiser celebrate her 100th birthday onboard. An NCL cruiser since 2005, Rose Zelman is an avid cruiser who has always loved traveling and exploring new places. The ship celebrated Rose by hosting a special dinner in her honor, which the captain attended and included a special cake to mark her milestone. There was even a balloon drop, and “Happy Birthday” was sung by the ship’s performers. 5. Carnival Cruise Line won “Best Ocean Cruise Line” as voted by readers of USA Today and 10Best.com. Princess Cruises took second place, while Viking, Norwegian, and Royal Caribbean won third, fourth, and fifth place, respectively. In addition to this honor, two of Carnival’s ships took home individual awards, with Carnival Sunshine named Best Mid-Sized Ship and Carnival Breeze the Best Cruise Ship for Families. 2018 was a big year for cruise news, and – let’s be honest – there are some stories with so much buzz that we’re still talking about them in 2019. From the announcement of the industry’s first roller coaster at sea to some harrowing at-sea rescues, we’re still reeling over these top stories. This week is a review of two back-to-back seven-night cruises that included Eastern and Western Caribbean itineraries aboard Princess Cruises’ Caribbean Princess. Over the course of the 14 days, the ship left Port Everglades and stopped in Cozumel, Roatán, and Costa Maya (Western itinerary) as well as St. Thomas, Princess Cays, and St. Maarten (Eastern itinerary). Caribbean Princess was recently refurbished in May 2017, and we hear a very thorough review of the onboard food venues and what they offer. Expanding on our top news story of the week, this video dives into the details around Carnival eliminating free room service. While Carnival argues that they’re simply aligning themselves with their competitors, cruisers argue that it’s another excuse to nickel-and-dime them.